The RSC camber plates are adjustable in the direction of camber and are gray anodized against corrosion in the standard color. Other colors on request. Fits directly on all RSC Suspensions coilovers. Also can be combined with adaptions with coilovers of other manufacturers. The adjustment for the fastening (usually sleeve / mounting nut piston rod) must then be carried out itself. If necessary, a selection of various mounting materials is available on request, but without guarantee. Please inquire with the required details as vehicle data, installed coilover, possibly installed strut brace and desired anodizing color. 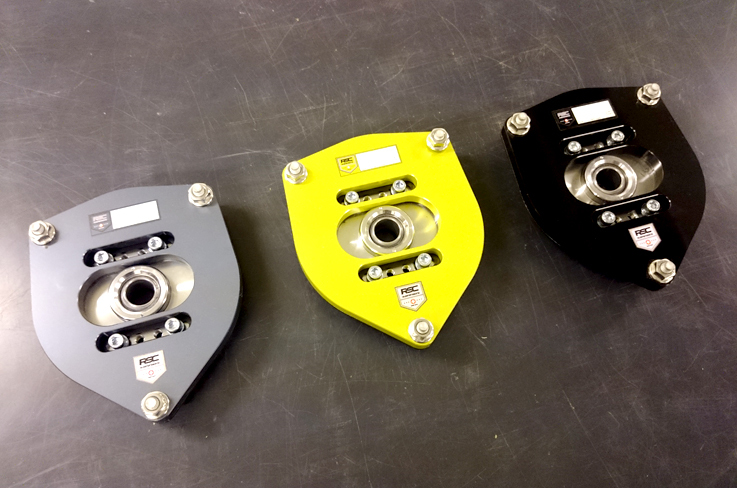 For the Renault Sport models listed below, the adjustable RSC camber plates are appropriate available. EG / ECE Type Approval No.